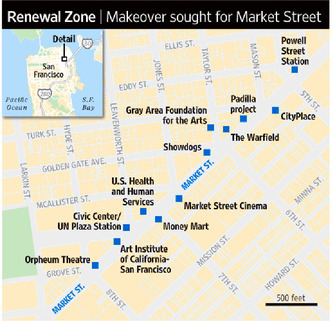 On a stretch of Market Street in San Francisco known for its boarded-up storefronts, a group of unlikely partners are working on a plan to make over the street. But some recent arrivals to the neighborhood say they are still waiting for the hoped-for benefits to materialize. Over the past two years, a group of city officials, nonprofits and developers have joined forces to help the blighted thoroughfare thrive. 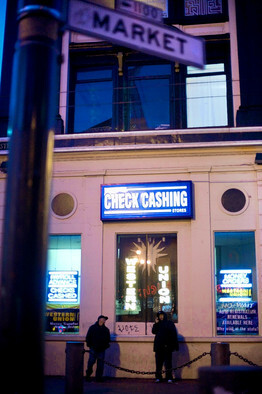 Their testing ground is Market Street between 5th and 6th Streets near the prime shopping district of Union Square, where they hope the development of a new shopping center and other amenities could kick-start growth. This isn’t the first initiative aimed at revitalizing Market Street. Over the years, city and community agencies and business people have waged numerous campaigns to clean up the area, but infighting over strategies and deeply ingrained social problems such as drug use and homelessness often derailed those efforts. This time, too, some are skeptical of the efforts, which have yet to pan out. But civic leaders and community groups say they hope to make more headway by working together in ways they hadn’t in the past. The loose coalition includes real-estate developer David Rhoades of Urban Realty Co., who plans this year to break ground on CityPlace, a 250,000-square-foot shopping center set to open on that stretch of Market Street in 2013. The nonprofit Tenderloin Economic Development Project, meanwhile, is seeking to turn the area into an arts hub. Yet even as the group moves forward with its plans, some newcomers to mid-Market say they are disappointed with the pace of change. “It’s hard,” says Josette Melchor, executive director of the nonprofit Gray Area Foundation for the Arts, which in 2009 moved to near Market Street and 6th Street. She says she has to keep the office doors locked at all times to keep out thieves, drunks and drug addicts. Market Street is one of San Francisco’s major thoroughfares and is considered the city’s main ceremonial space. Yet mid-Market has been afflicted with poverty and crime for decades. Already, two people have been killed this year within a block of the very stretch that Ms. Cohen and others hope to fix. The current effort to revive mid-Market stretches to 2004, when Mr. Rhoades, the developer, began amassing property on Market between 5th and 6th Streets. In September, he won approval from the city to build CityPlace, a $100 million shopping center that will house discount retailers. Since then, Ms. Cohen and her cohort have homed in on the block as their best shot at starting to improve the mid-Market stretch, in one case tapping Mr. Rhoades for help. In meeting with neighborhood advocates to promote his CityPlace plan, Mr. Rhoades got to know Elvin Padilla Jr. of the Tenderloin Economic Development Project, who hoped to attract theater companies and other arts groups into the area to piggyback on foot traffic to CityPlace. Mr. Rhoades introduced Mr. Padilla to a building owner across the street from the CityPlace site. Ms. Cohen, meanwhile, introduced Mr. Padilla to San Francisco theater company A.C.T., which was seeking property to house some of its performances. Last summer, Mr. Padilla struck a deal that lays the groundwork for a future purchase of the Market Street property, with the nonprofit and A.C.T. potentially buying it together. If all goes according to plan, an arts hub could take shape on the stretch of Market Street across from CityPlace by 2015. The plans are nascent and could fall apart, with years of fund-raising and permitting likely ahead. But those involved say they are optimistic about collaborations like this. “It seems like we’re all at the table for the first time,” says Judy Nemzoff, a program director at the San Francisco Arts Commission. There are other developments, too. Last January, the city created an $11.5 million loan fund for businesses willing to relocate to the area and is trying to reboot stalled efforts to turn the district into a “redevelopment area” eligible for certain financing. And through a Better Market Street Project, launched in December, the city plans to repave and beautify Market Street starting in 2014. Still, retail space in mid-Market is more than 20% vacant, compared with an overall vacancy rate of 5.5% in the city, according to Cassidy Turley BT Commercial. Some businesses drawn to mid-Market by promises of its renewal aren’t shy about their disappointment. Gayle Pirie, chef and co-owner of the Mission District restaurant Foreign Cinema, says she was wooed in 2009 to the mid-Market area by real-estate developer David Addington, who owns the Warfield, a concert venue in the area. Ms. Pirie and her partner joined with Mr. Addington that year to open Showdogs, a sausage specialty shop, on Market Street and 6th Street. Now, Ms. Pirie says the property owner “led us astray” with his talk of mid-Market as a burgeoning arts district. She says the often-dark theaters don’t draw enough traffic.